Shopping for Thomas the Tank Engine Preschool Toys? Pop & Go Thomas from Fisher-Price offers a Thomas twist on a classic tried-and-true toddler toy! Shaped just like the No. 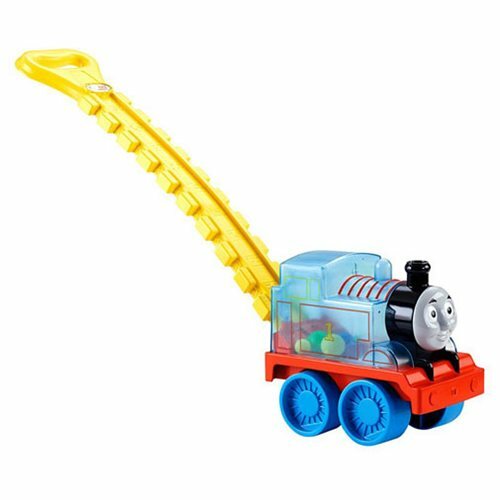 1 blue engine, this My First Thomas & Friends Pop & Go Thomas Popper lets your child use the handle to push Thomas around as the brightly colored balls create a fun, stimulating experience. Or remove the handle and your child can play with a large, chunky Thomas train that's perfect for little hands. As children push Thomas towards adventure, they'll discover a world of fun physical play! Ages 1 and up.